When someone is shopping for a home, one of the top five things on their “must have” list is a fence. The majority of buyers want a fence installed prior to purchasing a home or moving in. Having a quality fence installed on your property not only makes it more appealing to potential buyers, but it also increases your home’s value, adds a layer of privacy, and increases your security. Regardless of if you are planning to sell, or not, having a fence installed is a smart investment. The main challenge you face is which fence is right for you? To find the best fence for your home, family, and property, use the tips and information here. Do you want more privacy in your back or front yard? If so, you can choose a fence that provides you with partial or complete privacy from the outside world. Do you have pets or children? If so, you probably want to have a fence installed that can keep them safely contained and shielded from strangers. When you choose the right fence, it can significantly improve the appearance of your property. It can also improve your home’s curb appeal and add substantial value. The key here is to install the right fence. Another factor that can impact the type of fence you install is your home’s architecture. This can help you eliminate fence materials that just wouldn’t work. For example, can you imagine your Victorian mansion surrounded by a chain link fence? It’s important to understand what is appropriate and what isn’t. An older home, with classic architecture, is going to look best with an ornamental metal fence or brick fence. Contemporary ranch homes will be well complemented by a wood privacy or vinyl fence. You need to ensure there’s a design connection between the fence you choose and the architecture of your home. There are more than a few options when it comes to styles and materials for a fence. Take some time to observe your surroundings and the types of fences your neighbors have. What appeals to you? What doesn’t? Considering this, along with your home’s architectural style and even your landscaping can help you make the right decision. 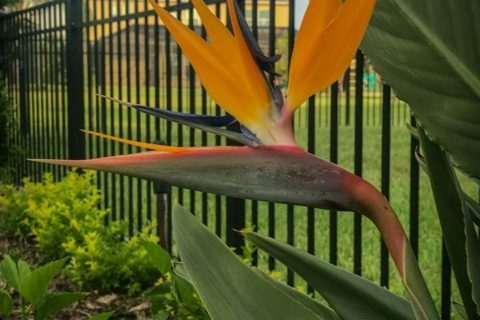 Regardless of your tastes, the reasons you are installing the fence, or the style you want, there are some basic fence materials used today. Each option has its pros and cons, and each one offers a distinctive look. Learn more about the most common fencing materials available, here. This is one of the most classic materials used for fences. Wood has been used for this purpose for years, and it remains popular because of the versatility it offers. For example, it can be built in any style, height or size. Wooden fences are extremely affordable – for the materials and installation. However, these do require more ongoing maintenance than other options. You will need to apply paint or stain every two to three years. Wood is also a sustainable, green material. You can turn the installation of your new wood fence into a fun, DIY project. To get the biggest bang for your buck, consider a redwood or cedar fence, as they stand up better to rot and pests. Getting to know what pests are attracted to what type of wood can also be beneficial when choosing a fencing material. Also, choose treated wood because it has a longer life than untreated wood does. A chain link fence is a sturdy, long-lasting, and maintenance free option. It’s quite affordable and pretty easy to install. This makes it a popular option for those with a lot of ground to cover. A chain link fence is also a “green” material because it can be recycled. The main downside to this type of fence is the utilitarian look. The good news is, there are some options to get around that, such as the vinyl coated styles available in basic colors. This type of fencing is also called plastic fencing. It has become popular in recent years because it is one of the few, truly maintenance free fencing options. You can keep it clean with your garden hose – that’s all that’s needed. 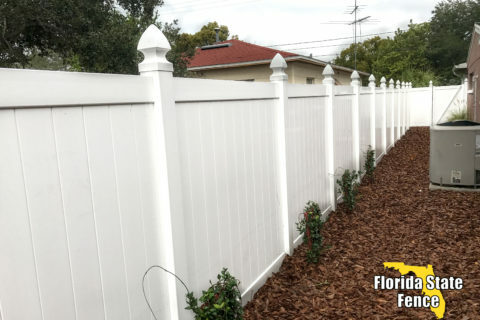 You can find vinyl fencing offered in several colors and styles. In fact, this type of fencing can be purchased in looks that mimic other popular types of fencing. Keep in mind, though, vinyl is one of the more expensive fencing materials available. As a result, if you have a lot of yard to cover, think about mixing it with one of the more affordable materials. This will help you get the look and durability you want, for a more affordable price. If you want to find the best fence for your yard, then start with the information here. By getting to know your options, and thinking about what you need and want, you can get the right fence for the right price. If you want some assistance with choosing a fence, or with installation, contact us. Our team of fencing pros can help ensure your fence meets all of your expectations – and more.